Years ago, HPe released the GL200 firmware for their HPe MSA 2040 SAN that allowed users to provision and use virtual disk groups (and virtual volumes). This firmware came with a whole bunch of features such as Read Cache, performance tiering, thin provisioning of virtual disk group based volumes, and being able to allocate and commission new virtual disk groups as required. The biggest thing with virtual storage, was the fact that volumes created on virtual disk groups, could span across multiple disk groups and provide access to different types of data, over different disks that offered different performance capabilities. 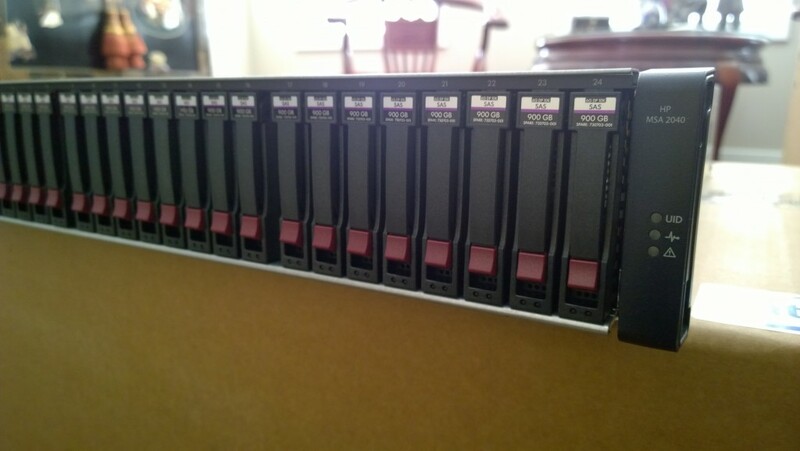 Essentially, via an automated process internal to the MSA 2040, the SAN would place highly used data (hot data) on faster media such as SSD based disk groups, and place regularly/seldom used data (cold data) on slower types of media such as Enterprise SAS disks, or archival MDL SAS disks. When the firmware was first released, I had no impulse to try it out since I have 24 x 900GB SAS disks (only one type of storage), and of course everything was running great, so why change it? With that being said, I’ve wanted and planned to one day kill off my linear storage groups, and implement the virtual disk groups. The key reason for me being thin provisioning (the MSA 2040 supports the “DELETE” VAAI function), and virtual based snapshots (in my environment, I require over-commitment of the volume). As a side-note, as of ESXi 6.5, ESXi now regularly unmaps unused blocks when using the VMFS-6 filesystem (if left enabled), which is great for SANs using thin provision that support the “DELETE” VAAI function. 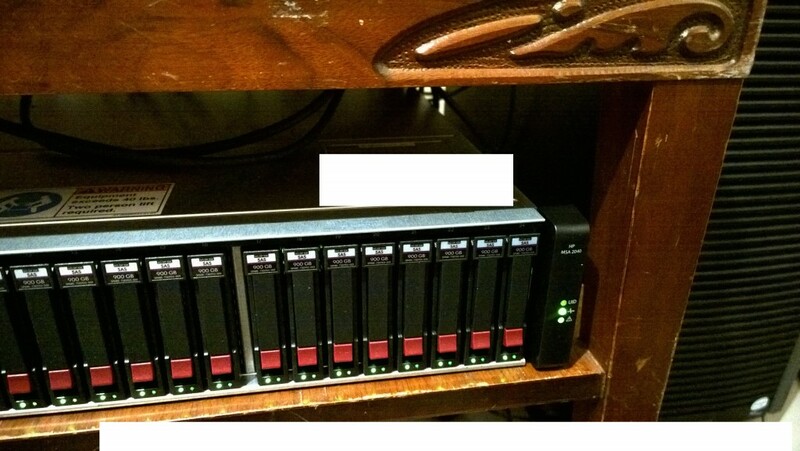 My environment consisted of 2 linear disk groups, 12 disks in RAID5 owned by controller A, and 12 disks in RAID5 owned by controller B (24 disks total). Two weekends ago, I went ahead and migrated all my VMs to the other datastore (on the other volume), deleted the linear disk group, created a virtual disk group, and then migrated all the VMs back, deleted my second linear volume, and created a virtual disk group. Overall the process was very easy and fast. No downtime is required for this operation if you’re licensed for Storage vMotion in your vSphere environment. During testing, I’ve noticed absolutely no performance loss using virtual vs linear, except for some functions that utilize the VAAI storage providers which of course run faster on the virtual disk groups since it’s being offloaded to the SAN. This was a major concern for me as block linear based storage is accessed more directly, then virtual disk groups which add an extra level of software involvement between the controllers and disks (block based access vs file based access for the iSCSI targets being provided by the controllers). Unfortunately since I have no SSDs and no extra room for disks, I won’t be able to try the performance tiering, but I’m looking forward to it in the future. I highly recommend implementing virtual disk groups on your HPe MSA 2040 SAN! Description: Reset to device, \Device\RaidPort0, was issued. 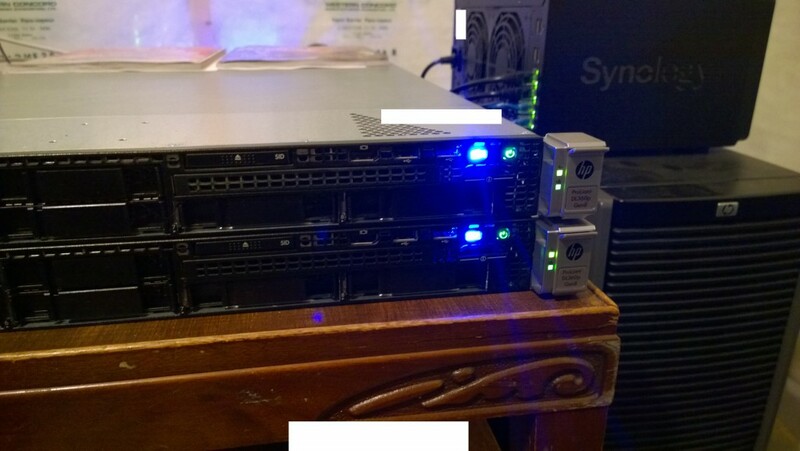 The server is an HP ML350p Gen8 (Windows Server 2008 R2) running latest firmware and management software. 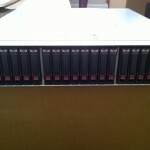 It has 2 RAID Arrays (RAID1, and RAID5), and a total of 6 disks. Researching this error, I read that most people had this occur when running the latest HP WBEM providers, as well as anti-virus software. In our case, I actually tried to downgrade to an older version, but noticed the warning still occurs. While we do have anti-virus, it’s not actively scanning (only weekly scheduled scans). I found these numbers to be very high in my experience. None of the other drives had anything close to this (in 4 years of running, only one other disk had a read error (a single one), this disk however had tons. For some reason the drive is still reporting as operational, when I’d expect it to be marked as a predicted failure, or failed. While all online documentation was pointing towards at locks on the array by software, from my own experience I think it was actually the array waiting for a read operation on the array, and it was this single disk that was causing a threshold to be hit in the driver, that caused a retry to recover the read operation. Called up HPe support, I mentioned I’d like to have the drive replaced. The support engineer consulted her senior engineer and reviewed the evidence I presented (along with ADU reports, and Active Monitoring health reports), the senior engineer concurred that the drive should be replaced. Replacing the drive resolved the issue. I’m also noticing a performance increase on the array as well. Make sure to always check the stats on the individual components of your RAID arrays, even if everything is operating sound. I have identified and confirmed with 2 different HPe MSA 2040 SANs an issue with SMTP notifications. I’ve identified the issue with multiple firmware versions (even the latest version as of the date of this article being written). The issue stops e-mail notifications from being sent from the MSA 2040 when the SAN is configured with some SMTP relays. This issue also occurs on HPe MSA 2050 arrays, as well as HPe MSA 2052 arrays. The main concern is that some administrators may configure the notification service believing it is working, when in fact it is not. This could cause problems if the SAN isn’t regularly monitored and if e-mail notifications alone are being used to monitor its health. -Occasionally if numerous tests are sent in a short period of time (5+ tests within 3 seconds), one of the tests may actually go through. To resolve this issue, I tried numerous things however the only fix I could come up with, is configuring the SAN to relay SMTP notifications through a Exchange 2013 Server. To do this, you must create a special connector to allow SMTP relaying of anonymous messages (security must be configured on this connector to stop SPAM), and further modify security permissions on that send connector to allow transmission to external e-mail addresses. After doing this, e-mail notifications (and weekly SMTP reports) from the SAN are being received reliably. -While in my case the issue was occurring with EXIM on a Sophos UTM firewall, I believe this issue may occur with other E-mail servers or SMTP relay servers. -Tried configuring numerous exceptions on the SMTP relay with no effect. -Rejected e-mail messages do not appear in the mail manager, only the SMTP relay log on the Sophos UTM. -Always test SMTP notifications on a regular basis. For those of you that use HP’s vibsdepot with VMWare Update Manager, you may have noticed that as of late you have not been able to synchronize patch definitions from the HP vibsdepot source. To fix this, simply log in to a vSphere client, jump to the “Admin View”, then “Download Settings” on the left. Right click on the HP related Download sources and simply update the URLs from hp.com to hpe.com and the problem is solved. After clicking on test, connectivity status updates to “Connected”. An issue that’s been making me rip my hair apart for some time… And a fix for you experiencing the same. -After a clean restart, a backup job completes successfully. Subsequent jobs fail until server or services restarted. -While the initial backup does complete, errors/warnings can be seen in the adamm.log and the Event Viewer even when successful. -Subsequent backups failing report that the device is offline. The Windows Device Manager reports everything is fine. -Windows Server itself does not report any device errors whatsoever. (Server: “WhatsMySRVRname”) The device state has been set to offline because the device attached to the computer is not responding. Ensure that the drive hardware is turned on and is properly cabled. After you correct the problem, right-click the device, and then click Offline to clear the check mark and bring the device online. ERROR = The device is offline! I spent a ton of time researching this… Old support threads were pointing me in all different directions, most of the threads being old, mentioning drivers, etc… Initially I thought it was hardware related, until through testing I got the gut feeling it was software related. There was absolutely no articles covering Backup Exec 2014 running on Windows Server 2012 R2 with this specific issue. Updating the HP software (agents, providers, HP SMH, WBEM) had no effect. Disabling the HP providers, and disabling the HP Monitoring, Insight, Management services had no effect whatsoever. Tried different firmware versions, also tried different drivers for the Library and Tape drive, no effect. Tried factory resets, no effect. Tried Library and Tape tools, all tests passed. Disabled other monitoring software we have in place to monitor software/hardware on clients servers, no effect. -Uninstalled the HP WBEM Providers and Agents. This needs to be added to ONLY and ALL the tape device entries (under HKEY_LOCAL_MACHINE\SYSTEM\CurrentControlSet\Enum\SCSI\) for the Tape Library and Tape Drives. You probably will have to create “Storport” key under the devices “Device Parameters” key. After doing this, the backups run consecutively with absolutely no issues. The event log is CLEAN, and Adamm.log is clean, and the “Faulting application name: wmiprvse.exe” errors in the event log no longer occur. -Both “fixes” were applied at the same time. I believe the WBEM providers/agent caused the Event ID 1000 errors on WMIPRVSE.exe. While the registry keys alone may have possibly resolved the backup issues, I believe there still would have been an underlying issue with WMIPRVSE.exe faulting that could have other consequences. -I do not believe the original installation of the HP WBEM providers caused the issue, I have a feeling a subsequent Windows Update, Backup Exec update, other module update, or an update to the HP software may have caused the issue to occur at a later time than original install. I do remember we didn’t have an issue with the backups for months, until one day it started occurring. 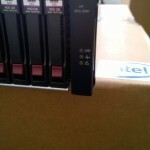 -I will be re-installing the HP providers and agents at a later time. I will be uninstalling all of them, and re-installing from scratch the latest versions. 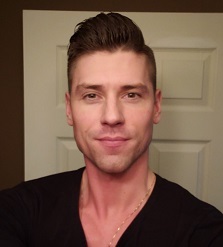 I will post an update with my results. -There is a chance the registry key is needed for the HP software to co-exist with Backup Exec backups for this configuration. -There is a chance that the registry key isn’t needed if you never load the HP software. For some time now, I’ve been having issues using HP Intelligent Provisioning to update the firmware of my HP Proliant DL360p Gen8 servers. Typically, when configured and when running the firmware update option, it times out saying it cannot connect to HP’s servers. With the recent separation of HP and HPe (HP Enterprise), I had a feeling this had to do with separation of their FTP server storage which houses all the updates. Keep in mind that version 2.x of HP’s Intelligent Provision package is only for Gen9 (Generation 9) servers. For Gen8 (Generation 8) servers, you need the latest version of 1.x which at this time is 1.62(b) dated August 5th, 2015. Download this version for your Gen8 servers from HPe’s Support website. After downloading the HPIP162b.2015_0730.43.iso file, burn it to a DVD, or mount it to a virtual media on your iLo connection, and update the software on the server during boot. After doing this, you will be able to connect and check for firmware. I’m assuming you probably need the updated 2.x image if you’re running a Gen9 server. I’ve had the HPe MSA 2040 setup, configured, and running for about a week now. Thankfully this weekend I had some time to hit some benchmarks. Let’s take a look at the HPe MSA 2040 benchmarks on read, write, and IOPS. -Running 2 “VMWare I/O Analyzer” VMs as worker processes. Both workers are testing at the same time, testing the same datastore. Please note: The MaxIOPS and MaxWriteIOPS workloads were used. These workloads don’t have any randomness, so I’m assuming the cache module answered all the I/O requests, however I could be wrong. Tests were run for 120 seconds. What this means is that this is more of a test of what the controller is capable of handling itself over a single 10Gb link from the controller to the host. -These benchmarks were done by 2 seperate worker processes (1 running on each ESXi host) accessing the same datastore. -I was running a VMWare vDP replication in the background (My bad, I know…). -Sum is combined throughput of both hosts, Average is per host throughput. Holy crap this is fast! I’m betting the speed limit I’m hitting is the 10Gb interface. I need to get some more paths setup to the SAN! In the last few months, my company (Digitally Accurate Inc.) and our sister company (Wagner Consulting Services), have been working on a number of new cool projects. 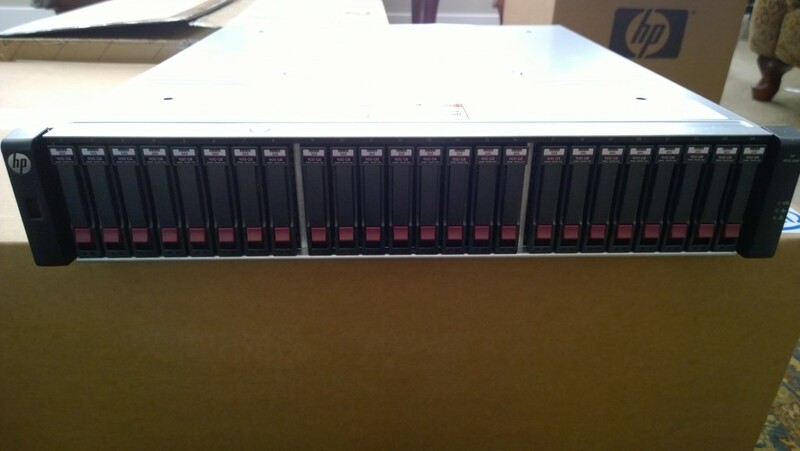 As a result of this, we needed to purchase more servers, and implement an enterprise grade SAN. 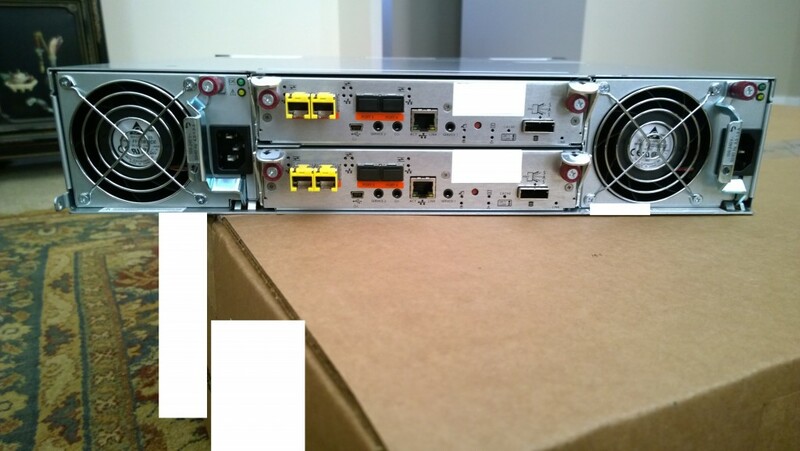 This is how we got started with the HPe MSA 2040 SAN (formerly known as the HP MSA 2040 SAN), specifically a fully loaded HPe MSA 2040 Dual Controller SAN unit. 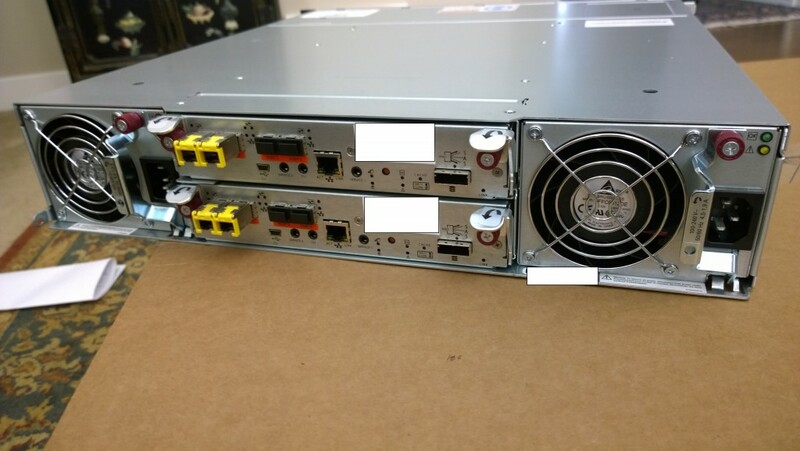 For the server, we purchased another HPe Proliant DL360p Gen8 (with 2 X 10 Core Processors, and 128Gb of RAM, exact same as our existing server), however I won’t be getting that in to this blog post. 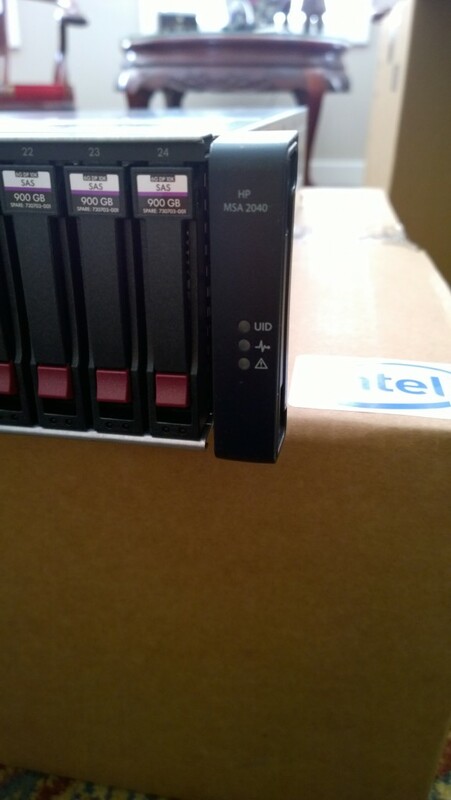 Now for storage, we decided to pull the trigger and purchase an HPe MSA 2040 Dual Controller SAN. 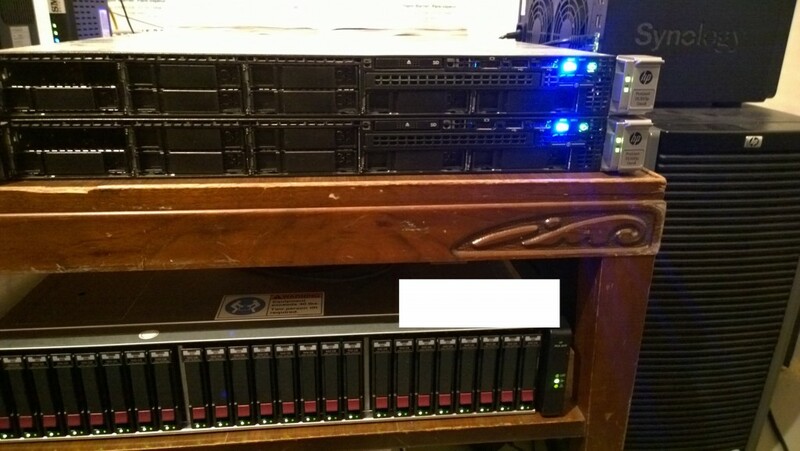 We purchased it as a CTO (Configure to Order), and loaded it up with 4 X 1Gb iSCSI RJ45 SFP+ modules (there’s a minimum requirement of 1 4-pack SFP), and 24 X HPe 900Gb 2.5inch 10k RPM SAS Dual Port Enterprise drives. Even though we have the 4 1Gb iSCSI modules, we aren’t using them to connect to the SAN. We also placed an order for 4 X 10Gb DAC cables. 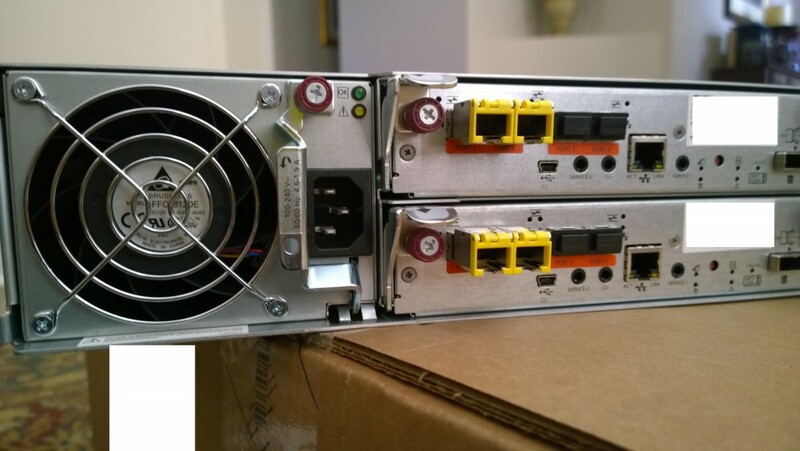 To connect the SAN to the servers, we purchased 2 X HPe Dual Port 10Gb Server SFP+ NICs, one for each server. The SAN will connect to each server with 2 X 10Gb DAC cables, one going to Controller A, and one going to Controller B.
I must say that configuration was an absolute breeze. As always, using intelligent provisioning on the DL360p, we had ESXi up and running in seconds with it installed to the on-board 8GB micro-sd card. I’m completely new to the MSA 2040 SAN and have actually never played with, or configured one. After turning it on, I immediately went to HPe’s website and downloaded the latest firmware for both the drives, and the controllers themselves. It’s a well known fact that to enable iSCSI on the unit, you have to have the controllers running the latest firmware version. Turning on the unit, I noticed the management NIC on the controllers quickly grabbed an IP from my DHCP server. Logging in, I found the web interface extremely easy to use. Right away I went to the firmware upgrade section, and uploaded the appropriate firmware file for the 24 X 900GB drives. The firmware took seconds to flash. I went ahead and restarted the entire storage unit to make sure that the drives were restarted with the flashed firmware (a proper shutdown of course). While you can update the controller firmware with the web interface, I chose not to do this as HPe provides a Windows executable that will connect to the management interface and update both controllers. Even though I didn’t have the unit configured yet, it’s a very interesting process that occurs. You can do live controller firmware updates with a Dual Controller MSA 2040 (as in no downtime). The way this works is, the firmware update utility first updates Controller A. If you have a multipath (MPIO) configuration where your hosts are configured to use both controllers, all I/O is passed to the other controller while the firmware update takes place. When it is complete, I/O resumes on that controller and the firmware update then takes place on the other controller. This allows you to do online firmware updates that will result in absolutely ZERO downtime. Very neat! PLEASE REMEMBER, this does not apply to drive firmware updates. When you update the hard drive firmware, there can be ZERO I/O occurring. You’d want to make sure all your connected hosts are offline, and no software connection exists to the SAN. Anyways, the firmware update completed successfully. Now it was time to configure the unit and start playing. I read through a couple quick documents on where to get started. If I did this right the first time, I wouldn’t have to bother doing it again. I used the wizards available to first configure the actually storage, and then provisioning and mapping to the hosts. When deploying a SAN, you should always write down and create a map of your Storage area Network topology. It helps when it comes time to configure, and really helps with reducing mistakes in the configuration. I quickly jaunted down the IP configuration for the various ports on each controller, the IPs I was going to assign to the NICs on the servers, and drew out a quick diagram as to how things will connect. Since the MSA 2040 is a Dual Controller SAN, you want to make sure that each host can at least directly access both controllers. Therefore, in my configuration with a NIC with 2 ports, port 1 on the NIC would connect to a port on controller A of the SAN, while port 2 would connect to controller B on the SAN. When you do this and configure all the software properly (VMWare in my case), you can create a configuration that allows load balancing and fault tolerance. Keep in mind that in the Active/Active design of the MSA 2040, a controller has ownership of their configured vDisk. Most I/O will go through only to the main controller configured for that vDisk, but in the event the controller goes down, it will jump over to the other controller and I/O will proceed uninterrupted until your resolve the fault. First part, I had to run the configuration wizard and set the various environment settings. This includes time, management port settings, unit names, friendly names, and most importantly host connection settings. I configured all the host ports for iSCSI and set the applicable IP addresses that I created in my SAN topology document in the above paragraph. Although the host ports can sit on the same subnets, it is best practice to use multiple subnets. 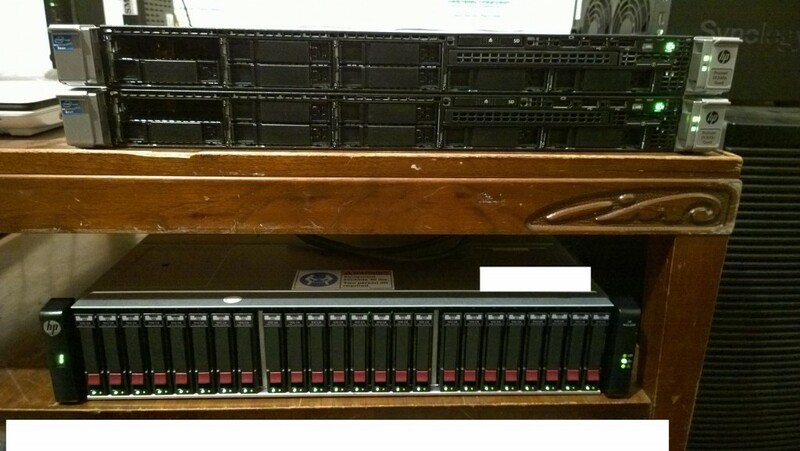 Jumping in to the storage provisioning wizard, I decided to create 2 separate RAID 5 arrays. The first array contains disks 1 to 12 (and while I have controller ownership set to auto, it will be assigned to controller A), and the second array contains disk 13 to 24 (again ownership is set to auto, but it will be assigned to controller B). After this, I assigned the LUN numbers, and then mapped the LUNs to all ports on the MSA 2040, ultimately allowing access to both iSCSI targets (and RAID volumes) to any port. I’m now sitting here thinking “This was too easy”. And it turns out it was just that easy! The RAID volumes started to initialize. 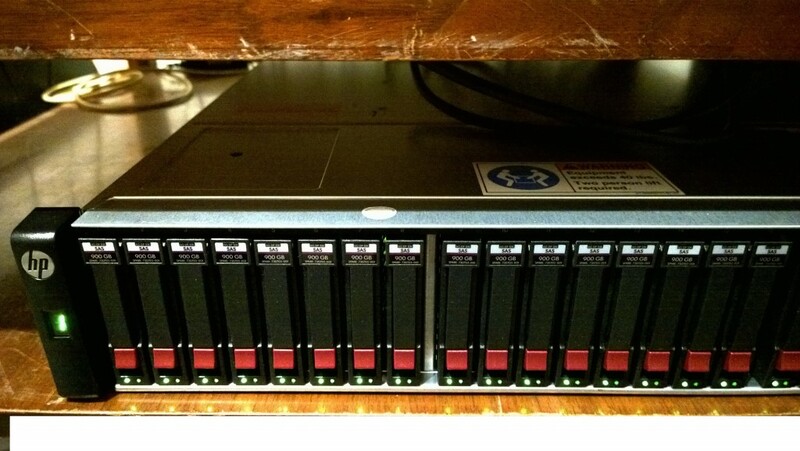 At this point, I jumped on to my vSphere demo environment and configured the vDistributed iSCSI switches. I mapped the various uplinks to the various portgroups, confirmed that there was hardware link connectivity. I jumped in to the software iSCSI imitator, typed in the discovery IP, and BAM! The iSCSI initiator found all available paths, and both RAID disks I configured. Did this for the other host as well, connected to the iSCSI target, formatted the volumes as VMFS and I was done! I’m still shocked that such a high performance and powerful unit was this easy to configure and get running. I’ve had it running for 24 hours now and have had no problems. This DESTROYS my old storage configuration in performance, thankfully I can keep my old setup for a vDP (VMWare Data Protection) instance. I’ve attached some pics below. I have to apologize for how ghetto the images/setup is. Keep in mind this is a test demo environment for showcasing the technologies and their capabilities. Update: HPe has updated the MSA product line and the 2040 has now been replaced by the HPe MSA 2050 SAN Dual Controller SAN. There are now also SSD Cache models such as the HPe MSA 2052 Dual Controller SAN.